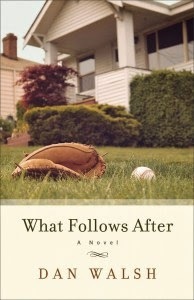 I recently finished reading Dan Walsh's most current book, What Follows After. It took me a while to get into the story. Although the book seemed a little luke-warm at the start, it was enjoyable enough to keep reading through. The realistic story of a failing marriage, the struggles of life in the early '60's and the minds of two brothers wanting to set everything right again in their world. What Follows After takes place in a season that I barely remembered as a child, so it was easy to believe what life was like then, complete with jealousy, work-aholism, and infidelity. The boy's perspectives were easy to follow as they schemed and planned, and eventually faced the consequences of their surprise adventure away from home. The ending half of the book was more captivating than the first half, and consumed it quickly once the pieces of the mystery began to come together. The relationship between the elder Harrison family's "domestic help" and the younger Harrison family, and even between Mamie Lee and Etta Mae was charming. It was confusing to me at first, why it was included - almost a distraction - but soon enough it was the thread of the story I most wanted to know more about. It was a nice touch to have had that realistic relationship included. The many details of the nuclear threat I found boring, and perhaps it was those details, and the space they took up, that made me not as interested in the start of the book. I found myself skipping over many of the details, to get to the human relationship details of the story. I realize that is more of my personal preference, as it was written well, and set the scene for the story, however had little impact on the main characters. Still, it was a refreshing book, and I loved the touches of God woven through the story. THAT made it a worth while book to read! The book is available on Amazon for print and Kindle users, and in bookstores everywhere.